Can you remember any other country placed in the VWP amidst an economic crisis in that country? I don’t know, I can’t recall, but I’m curious. Here is a timeline of the Greek economic crisis from Reuters. 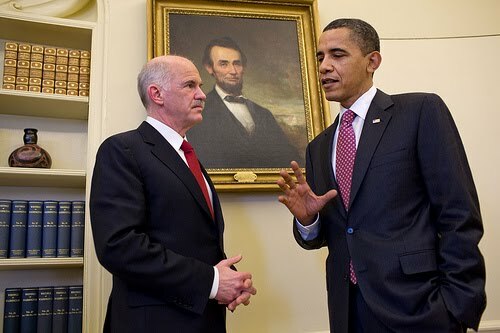 It looks like on the same day the VWP was announced, Greece President Papandreou was visiting Washington and was quoted as saying that President Obama encouraged Athens’ effort to curb speculators who they blame for worsening the debt crisis. in the Oval Office, March 9, 2010. Two days after this announcement, public and private sector workers went on strike in Greece grounding flights, shutting schools and halting public transport in the second nationwide walkout. The Department of State considers Libya a high crime country. While official statistics are often inaccurate and difficult to access, crime has increased in recent years and outpaced the efforts of an under-equipped police department and an inefficient judicial system.The majority of crimes are property crimes, including pick-pocketing and purse-snatching. Criminals often target tourists and wealthy-looking foreigners, especially foreign women. Libyan criminals are mostly young, single men who commit crimes of opportunity both during the day and at night. While they are not often violent, victims may be jostled or pushed to the ground during the commission of a crime. Victims who resist may be subjected to greater violence. Vehicle thefts are on the rise. Sexual harassment against foreign women continues to be a serious problem. Foreign women face routine harassment such as cat-calling and groping. Most foreign women are targeted while traveling alone or in pairs. However, the Libyan police have been somewhat successful in arresting and convicting sexual offenders. Tripoli police do not maintain comprehensive crime statistics for individual neighborhoods and it is difficult to obtain an accurate assessment of the general crime level in Tripoli. Residential burglary is the most common crime reported by expatriates in Libya. Burglaries that were reported have occurred both during the day and at night. Rising burglary rates have caused many foreign individuals and companies to invest in residential security measures such as metal grillwork, alarm systems, and anti-climb devices. Burglars often carry edged weapons both as tools for entry and as a deterent against uncooperative victims. Carjacking is an emerging crime in Libya. Carjackers may cause minor accidents as a pretext for luring their intended victim into stopping and exiting the vehicle to inspect for damage. Several foreigners in Tripoli have been carjacked in this manner; nearly all of them left their keys in the ignition when they exited their vehicles, thus making it easier for the carjackers. While Libyan media do not report extensively on crime, there is a private perception that crime has increased due to the growing prevalence of wealthy foreigners and western goods, as well as growing numbers of migrant workers from around Africa. High unemployment and a rising cost of living also contribute to crime rates in Libya. If you are victimized, proceed immediately to the nearest police station, hotel, or major business for assistance.